I have continued creating each chapter, re-creating storyboards, doing photoshoots, undertaking iterative research and developing technical skills in After Effects and Green Screen. This chapter is work in progress as I am still unsure of what I want to communicate. To help the process I decided to review previous research and placed quotes, comments and images in my sketchbook. I knew that I wanted the scene to be based around a board game as originally the film was planned to be playful and have a games and toys theme. 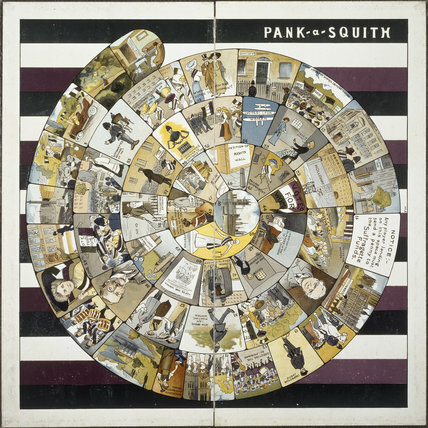 This was a reference to the suffragettes’ board game Pank-a-Squith, a simple game of chance highlighting the historical events of the movement and was sold to raise money for their cause. My version would pay homage to the board game. In the previous unit I completed an excerpt from the film Hysterical Females: making the centenary of women’s suffrage. The clip was entitled An English Rose and looked at young women as decorative ornaments being groomed for marriage.